Starwood Hotels & Resorts has announced that its world-renowned Westin brand has reached the 200th hotel milestone with the opening of The Westin Chongqing Liberation Square in China. Westin will follow this growth milestone with the opening of three more hotels in China: The Westin Zhujiajian Resort in Zhoushan, The Westin Blue Bay Resort in Qingshui Bay, Hainan and The Westin Haikou in Hainan. Starwood expects to open a total of nine new Westin hotels worldwide in 2014 and nearly another 30 by the end of 2016, with almost half of those new hotels in Asia Pacific, the brand’s fastest growing region. 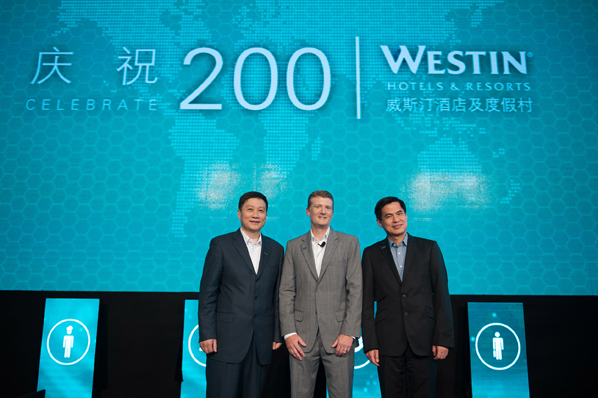 “The Westin brand has built a strong foundation and following in established markets over the last decade, and the fact that we have opened our 200th Westin in China is illustrative of the phenomenal demand we are now experiencing in Asia Pacific, as well as our strong and deep-routed local teams in dynamic markets worldwide,” said Simon Turner, president of global development for Starwood. Demand for Westin continues to surge in China and India, the world’s two fastest growing travel markets. The opening of The Westin Chongqing marks the Westin brand’s debut in this important economic hub in southwest China and offers travellers an ideal location in the city’s central business district. By year’s end, the Westin portfolio in China will surpass 20 hotels, including debuts in several other new markets such as Zhujiajian in Zhoushan, Qingshui Bay and Haikou in Hainan. In the next three years, the Westin portfolio in China will increase by nearly 50 per cent with the addition of 11 new hotels. Turner added: “As more and more people have the means and desire to travel, particularly from China which is now the world’s largest tourism source, we are seeing increased demand for resort destinations. In India, Westin will also open The Westin Delhi NCR Noida next year, as the brand remains on track to grow its portfolio in the country by 50 per cent in the next three years. In Indonesia, Westin will jump from one to three hotels in the next two years. In addition to The Westin Ubud Resort & Spa opening in Bali this fall, the brand will debut The Westin Jakarta in 2015. Westin also continues to reignite in markets across Asia Pacific with the brand’s return to Singapore last November after a 12-year absence and in 2016 will re-enter the Philippines. In the Middle East, Westin is expanding rapidly and will triple its portfolio by 2016 with the addition of five new hotels in markets including Saudi Arabia, Jordan and the United Arab Emirates.